Coming for a visit to see Rome in 3 days? Wondering what to do and how to fit it all in? You've come to the right place! Visiting the Roman Forum, or even just getting a view of it like this, is part of my perfect 3-day visit to Rome. Oh, and look, there's the Colosseum in the background. Yeah, we'll visit that, too. I know one size does not fit all. But after years of helping thousands of people plan their visit to Rome, I've learned there are some fairly common elements to many visitors' trips to Rome, especially if it's their first time (or their first time after a long time). If I moved away from Rome, then came back to visit with a friend who'd never been here before, this is how we'd see Rome in 3 days. Rome in 3 Days - what will work for you? Are you on a romantic city break? Are you visiting with small children? Teenagers? Have you seen all the main things, and are you now looking for new ideas for things to see in Rome in 3 days? Do you like to "see as much as you can"?, staying out all day to maximize your time? Figure you'll sleep when you get home? These are some factors I know can make a difference in how people decide what to do in Rome in 3 days. So we'll take them into account when appropriate, in the itinerary below. Rooftop view of Rome from the Pincio hill - in my opinion one of the best ways to begin a visit to Rome in 3 days. Your first day in Rome will affect how you think about Rome when you leave it. On my first visit here as a college backpacker, I did NOT enjoy Rome at all. My friend and I did it all wrong. We had no plan, no idea where to go, and just decided last minute to go visit the Vatican and see the Sistine Chapel. We went without checking their hours or anything at all about what a visit would be like. We did not get there in time, did not get in, and wasted half the day. We also TRAVELLED there the wrong way, and only experienced loud busy streets, traffic and tons of tourists. Bad impression. It does NOT have to be this way. I've put this itinerary for Rome in 3 days in the order I'd do them. Of course you could mix up the days as you prefer. Let's start our sight-seeing in Rome with a typical Roman breakfast. I love having a cappuccino and cornetto (Italian version of a croissant) to start my day in Rome. We'll do as the Romans do, and just find the nearest bar (café). A typical Roman breakfast (at a bar) consists of cappuccino (or another hot drink) and cornetto (Italian version of a croissant, and there are many versions of this - plain, filled with cream, jam or chocolate, whole-grain, etc). You can have your breakfast standing at the counter (which is what the Romans do, and which is what costs the least). Or you can plunk yourself down at a table, preferably outside, and watch the scenery unfold before you. Enjoying the atmosphere at the Piazza San Lorenzo in Lucina is a very Roman thing to do. First time in Rome - Be aware that it costs more to sit down at a cafe and consume anything than it does to stand at the bar. Make sure to look for the price list showing bar vs. table prices before you order. Travelling with children - You might get them a fresh squeezed orange or pomegranate juice, or a hot chocolate. In Italy, hot chocolate is pretty dense. If you opt for whipped cream on top, know that it may not be as sweet as your kids are used to. Solo traveler - Stand at the bar if you feel like getting a move on (and saving money), but otherwise, don't be shy. It's common to see people sitting alone at a cafe, enjoying their coffee. No need to feel self-conscious. You may be arriving in Rome from another city in Italy or Europe, or from a cruise ship. If your first day will begin at lunch or post-lunch, you can still do the below, perhaps after a quick Roman coffee first. You may be arriving in Rome early morning from overseas and will be jet-lagged. I suggest having a small walk around until you can check in to your room/apartment, a max 2-hour nap, then heading out in the early afternoon. It's not easy to sight-see in Rome on no sleep. Bottom line - you can do the below itinerary as a half-day activity, fitting in what you can. After we've fortified and soaked up some Roman ambiance, we'll walk around the historic center and see some of the most beautiful sites in the world. These sites are all fairly close to each other. You may see some or all of these sites. Just go at your own pace. Piazza Barberini is a great place to start our walk. It's easy to arrive here by Metro, and we begin with one of Gian Lorenzo Bernini's beautiful fountains. As you can see from the below map, you could start where you want. If you are staying outside of the city center, take a bus or metro into the center to one of the starting points. I suggest starting at Piazza Barberini and walking up via Sistina to the top of the Spanish Steps. One reason I love to start our intro to Rome in 3 days at the top of the Spanish Steps is that we begin high up, and will slowly make our way down. Starting Point for Rome in 3 Days - Top of the Spanish Steps. Part of being high up is starting with some pretty nice views of Rome. 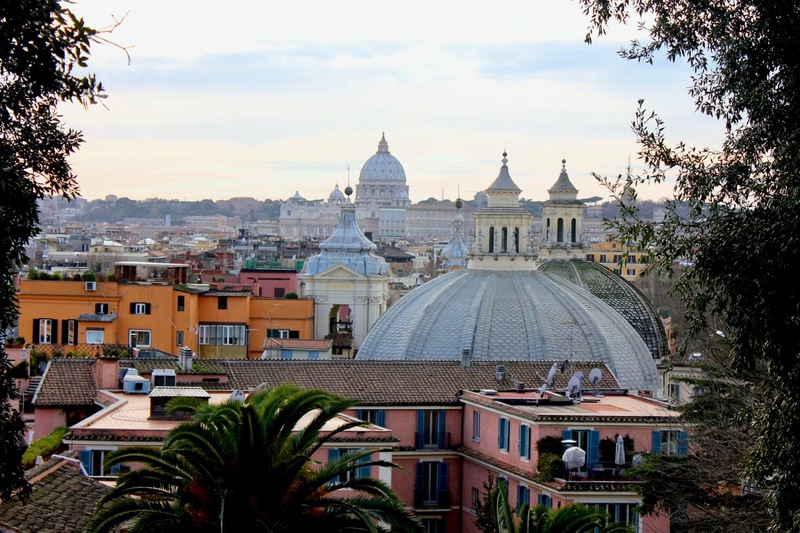 The Pincio offers some of the most beautiful, and usually un-crowded, views of Rome's rooftops. It just gets better as we walk along. The Pincio hill offers some of the best rooftop views of Rome. When the road forks, we'll take the one going up, so we can get this view. That's Piazza del Popolo down there. After enjoying the views from up here, we'll go down there next. Just behind you is the Villa Borghese park. If you walk back into it, you will come to a carousel, a café, places for bike and other rentals, and lots of fun things to do, for adults and kids alike. Walking down from the Pincio, we arrive in Piazza del Popolo. That Egyptian obelisk in the middle, with its original hieroglyphs, is one of the oldest and largest in Rome. The Flaminio obelisk was made in Heliopolis, Egypt around the 13th century BCE, and stands about 70 ft (24 m) tall. Rome's first emperor, Augustus, brought it back from Egypt in 10 BCE as a sort of war trophy. 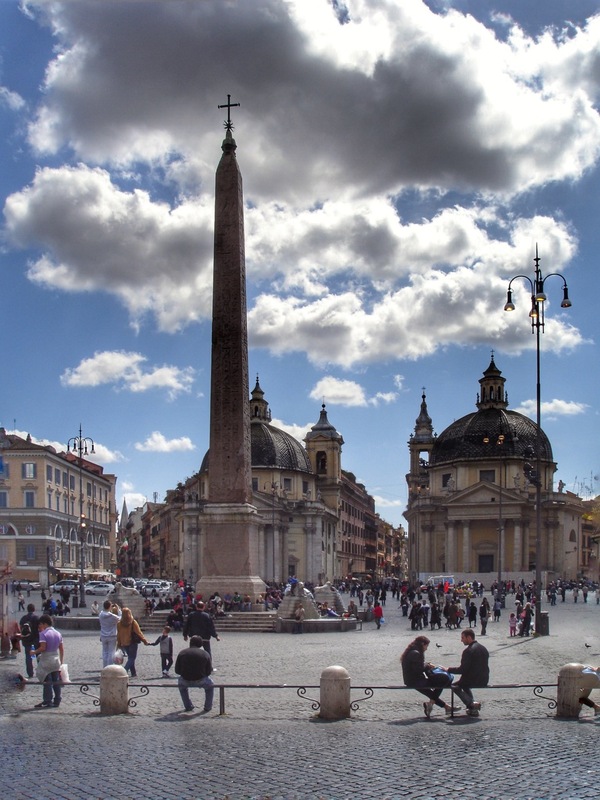 This obelisk stood in the middle of Circus Maximus in Ancient Rome, and was moved to this piazza in the late 1500's. Are you an art-lover? Looking to see more stuff on this walk? 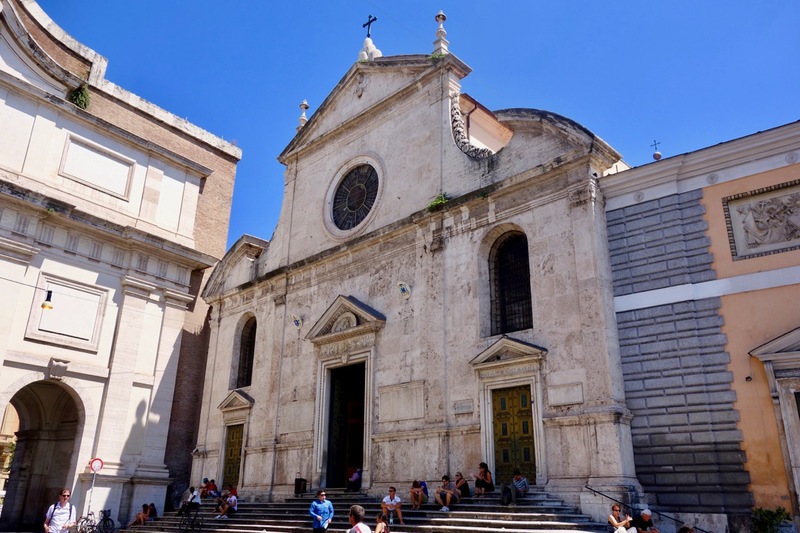 Pop into Santa Maria del Popolo, the church at the edge of the piazza. This Renaissance church is home to a treasure-trove of art, including works by Caravaggio, Bernini, Raphael, Pinturicchio, Carracci, Bramante, and others. The Leonardo da Vinci museum underneath the church of Santa Maria del Popolo is a fantastic thing to visit, for all ages. Not just for kids, the exhibit of Leonardo da Vinci's inventions underneath the church is extraordinary, and much larger and more interesting than it appears from the outside. We are going to make our way back towards the bottom of the Spanish Steps. I love cutting back to this sweet little street, via Margutta. 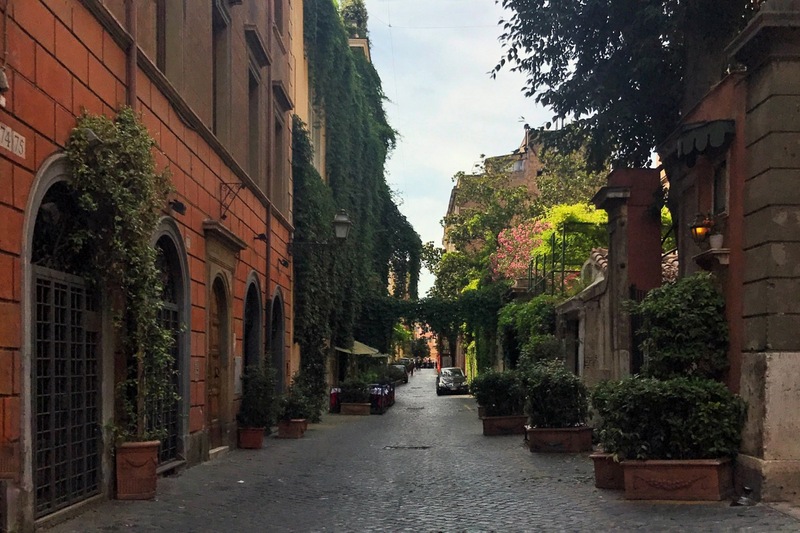 One of the prettiest streets in Rome, via Margutta goes from wisteria in early spring, through jasmine, bougainvillea, and other flowering plants throughout the summer. It's mostly an artists' street, filled with art galleries, antique shops, one-off artisan shops, and lots of local ambiance. It also happens to be where Gregory Peck's character lived in the 1960's classic movie "Roman Holiday". Swoon! On a romantic break? Looking for a special stop? The Hotel de Russie, immediately to our left as we leave Piazza del Popolo walking down via del Babuino, is one of the most luxurious, and most beautiful, hotels in Rome. And they have a garden in the back. 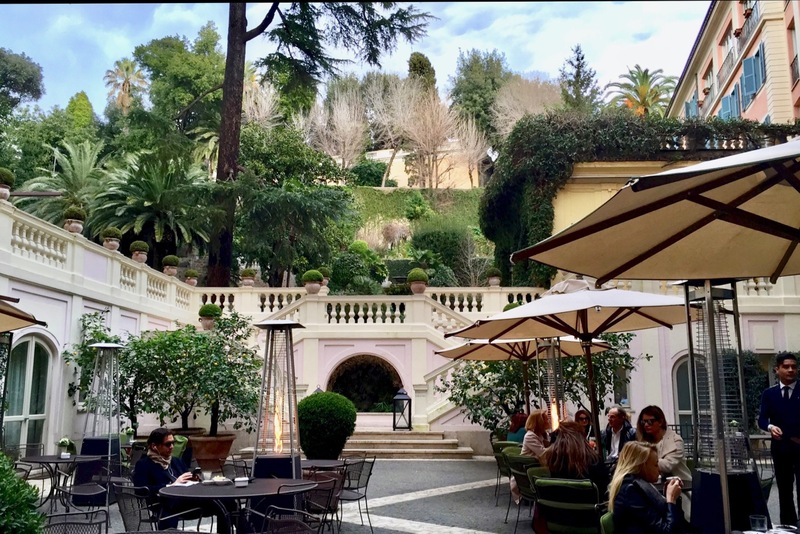 The garden in the back of the Hotel de Russie is one of my favorite "secret" spots in Rome, for a coffee or aperitivo. You can visit it year round (there are heat lamps for winter). It's not inexpensive but it is a very special way to spend a few moments enjoying a coffee or aperitif. Once at the bottom of the Spanish Steps, we can take some nice photos of the whole panorama. The Spanish Steps, including the church at the top, Trinità dei Monti, and the Barcaccia fountain below. 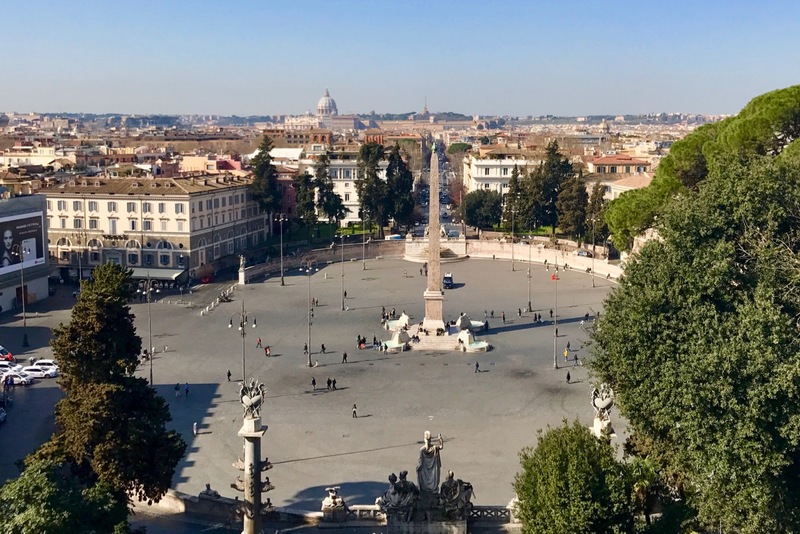 You can skip the Pincio/Piazza del Popolo/via Margutta, and walk down the Spanish Steps from our starting point at the top. The Spanish Steps neighborhood is Rome's primary shopping zone. The most famous street in the area, lined with many of the most notable fashion brands in the world, is via Condotti. I prefer to walk down via Frattina, but it's up to you. Via Condotti is Rome's most famous "posh" shopping street. The Pantheon is just amazing. Literally. It stops me in my tracks and amazes me. Every single time I see it. And I live here. The pantheon in Rome. It just awes me every single time I see it. Can you believe it's still standing after nearly 2000 years? Built by the emperor Hadrian around 120 C.E., it has the world's largest unreinforced concrete dome (see, I said it's amazing). The Pantheon was originally built to worship the Roman gods, but in the 7th century it was turned into a Catholic church. It's also a mausoleum for Italy's kings and queens, and the artist Raphael is buried here too. Want to fit in more stuff? San Luigi dei Francesi - a beautiful French church, with a chapel containing 3 Caravaggio paintings depicting the Life of Saint Matthew. 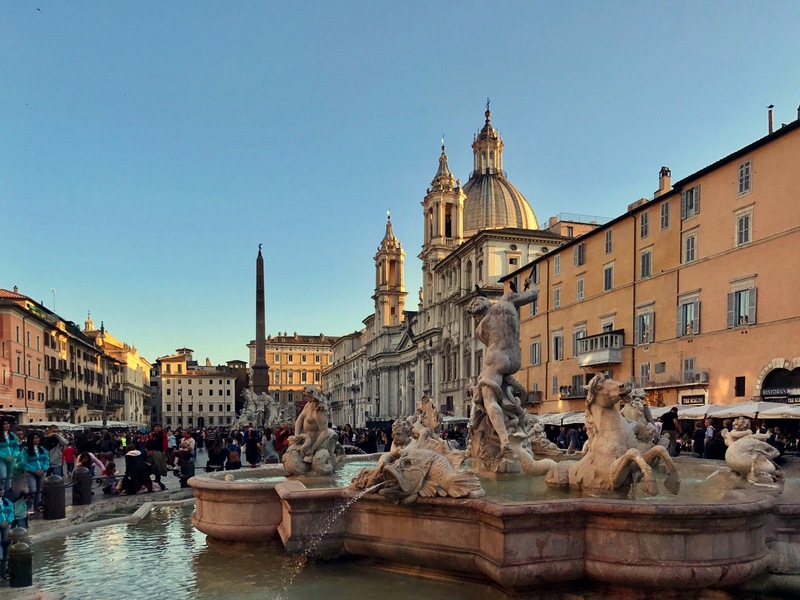 Piazza Navona is arguably one of the most beautiful piazzas in Rome (and just a 3-minute walk from the Pantheon). The piazza was built on top of what was originally a stadium in ancient Rome (in use at the same time as the Colosseum). Piazza Navona - my favorite, and in my opinion, the most beautiful piazza in Rome. Today Piazza Navona is home to stunning baroque architecture, in particular the church of Sant'Agnese in Agone, and three fountains, two of which were designed by Gian Lorenzo Bernini. Want more stuff to do? Travelling with teenagers/kids? You can visit part of the remaining structure of Domitian's stadium, underneath Piazza Navona. Go towards the rounded end of the Piazza and on the left-hand side you will see the entrance. On a romantic city break? Head to the rooftop terrace of the Eitch Borromini hotel (May - October), for stunning rooftop views of Rome, and sunsets. To get there, walk behind Piazza Navona to Via di Santa Maria dell'Anima, 30. 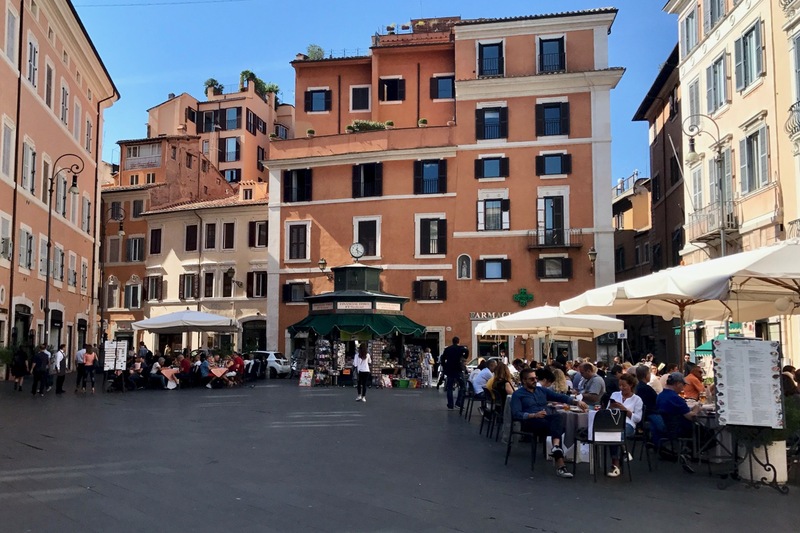 Just a short walk from Piazza Navona, Campo dei Fiori is another beautiful piazza from Renaissance and Baroque times (used as a market, but also for public executions). Today it's mostly known for its open-air market, and its high concentration of lively bars and pubs and places to eat. Campo dei Fiori is home to Rome's only outdoor covered market, and is full of beautiful art and architecture from the Renaissance and Baroque periods. That statue in the middle of the square honors the philosopher Giordano Bruno, burnt at the stake on this spot for heresy in 1600. He was later exonerated for his crime (insisting the earth went around the sun), hence this statue of him. Staring hard, straight across the river at the Vatican. Largo Argentina is known for two things: It's where Julius Caesar was assassinated on the Ides of March, 44 B.C.E. The ruins at Largo di Torre Argentina - this is where Julius Caesar was assassinated on March 15, 44 B.C.E. And it's a city-sanctioned cat sanctuary. If you are a cat-lover, you will be pleased to see many cats living among the ruins. You can even go down the stairs on one side and visit them (and you can adopt, even from afar). If you are not a cat-lover, just know the cats are fed, cared for, and living in the ruins and will not bother you. We'll top off our day with the one, the only, the Trevi Fountain. The Trevi Fountain in Rome - a must see whether you are in Rome in 3 days or just 1! Built over 130 years, and with some traces of influence by Bernini, this iconic fountain was completed in the 18th century by Nicola Salvi. My favorite thing about the Trevi fountain is that you can hear it before you see it. Listen as you get closer and you will hear it too. And that's a wrap for Day 1 of our Rome in 3 Days visit. Looking for someplace to eat nearby? They are on the map embedded on this page, Rome in 3 Days. But you can also visit my pages about Where to Eat Near the Trevi Fountain and Where to Eat Near the Spanish Steps. Today we visit the Vatican (unless it's a Sunday, or you had to book a tour or special visit another day). There are many ways to approach this visit but for our purposes, we are going to take a mid-morning tour. Most people not staying near the Vatican take the Metro and come out at the Ottaviano stop. This is perfect for us, too. As you can guess, I want to start the day with a yummy Roman breakfast. So we'll head to Sciascia Caffè for the perfect coffee and a pastry. Scia scia café is one of the beat places to have coffee near the Vatican. First, it's near the Ottaviano metro stop. Second, it's famous for serving up some of Rome's best coffee. And that's saying a lot! I opted for a small-group tour, so we can hear the guide up close, and also have a better chance to ask questions. Every Vatican Museums tour includes the Sistine Chapel. It's the last thing to visit inside the Vatican Museums. 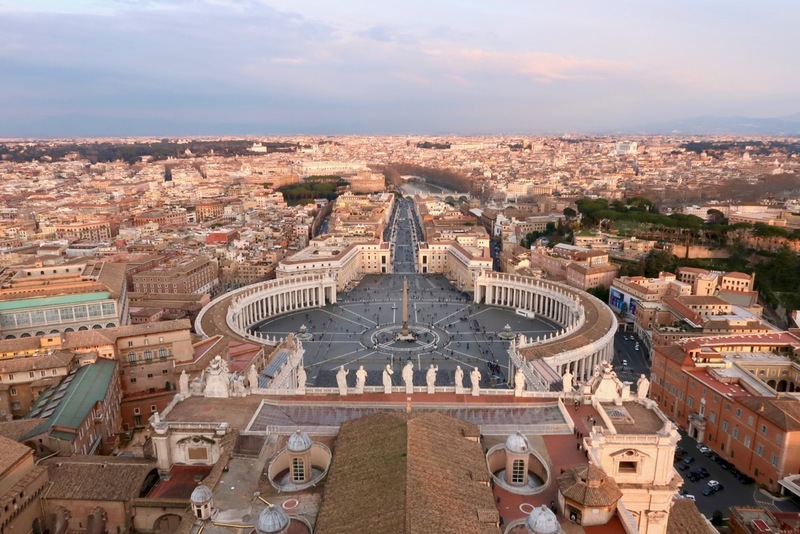 We'll take the shortcut from the Sistine Chapel to St. Peter's basilica. I like getting a tour of the basilica as well as the museums. It IS the largest church in the world and there's just so much history, art, and architecture. Once our guide leaves us, we'll just sit down in a side-chapel and rest a little. What better place to contemplate our day, and what we've seen and done so far? Next, we'll make our way back to the entry of the basilica, and turn left towards the ticket office for climbing the dome. What an amazing sight! Once we come down from the dome, we'll end up back in the basilica. 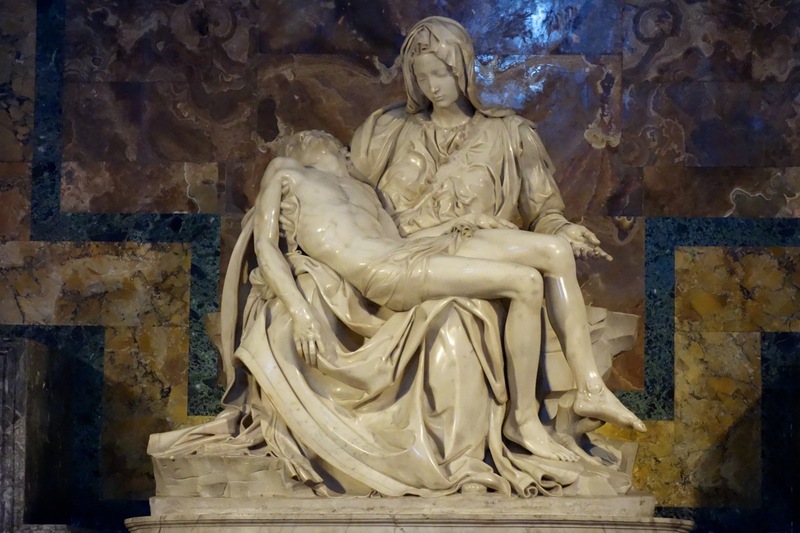 One last long gaze at Michelangelo's Pietà and off we go. We still have to walk through St. Peter's Square. It's a sight to see all by itself. It's possible (and a great idea) to visit Castel Sant'Angelo on a visit to Rome in 3 days. While I think we've done plenty for the day, Castel Sant'Angelo is right on our way back across the river to the center of Rome, and it's convenient to visit it after a Vatican visit. So if on your visit to Rome in 3 days, you want to fit in more stuff, this is a great option. 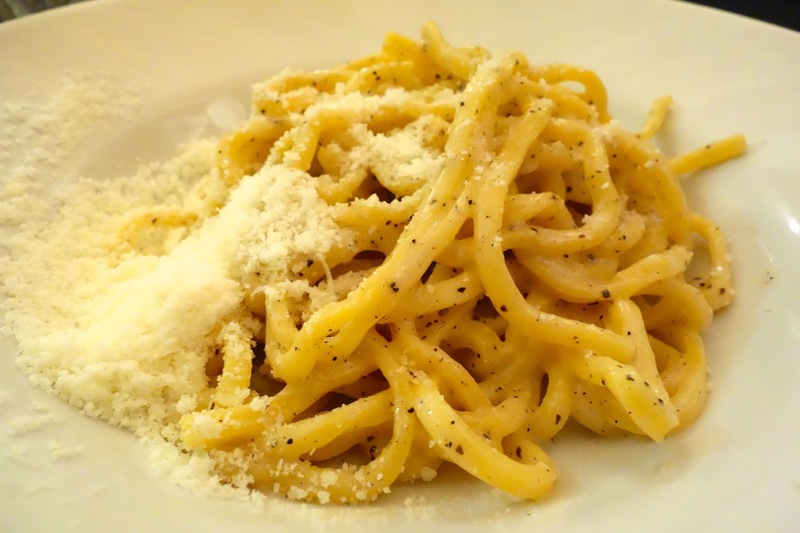 I've listed places to eat on the map embedded on this page, Rome in 3 Days. You can also visit my page about Where to Eat Near the Vatican. Whether we visit Castel Sant'Angelo or not, we will cross Ponte Sant'Angelo, the Angel Bridge. The bridge has been there since ancient Roman times, but the angels are from the 1600s. Many people think Bernini made the angels but they are not his. He did make models for a couple of them, and those models are in the church of Sant'Andrea del Fratte. The 12 angels on this bridge represent the 12 stations of the cross. It begins on the opposite side of the bridge from us, so from the castle, it's actually the end of the Via Crucis. One of the prettiest streets in Rome, and one of the most fun strolling/shopping/people-watching streets, is via dei Coronari. We end up right near Piazza Navona. For the rest of today, we can visit some sites we may not have gotten to on the first day, stroll around or take a nap before dinner. And that's a wrap for Day 2 of our Rome in 3 Days visit. Want more stuff to do? Visit Palazzo Altemps right near Piazza Navona. This wonderful collection of Greek and Roman sculptures resides in an old ducal palace that's a work of art in itself. 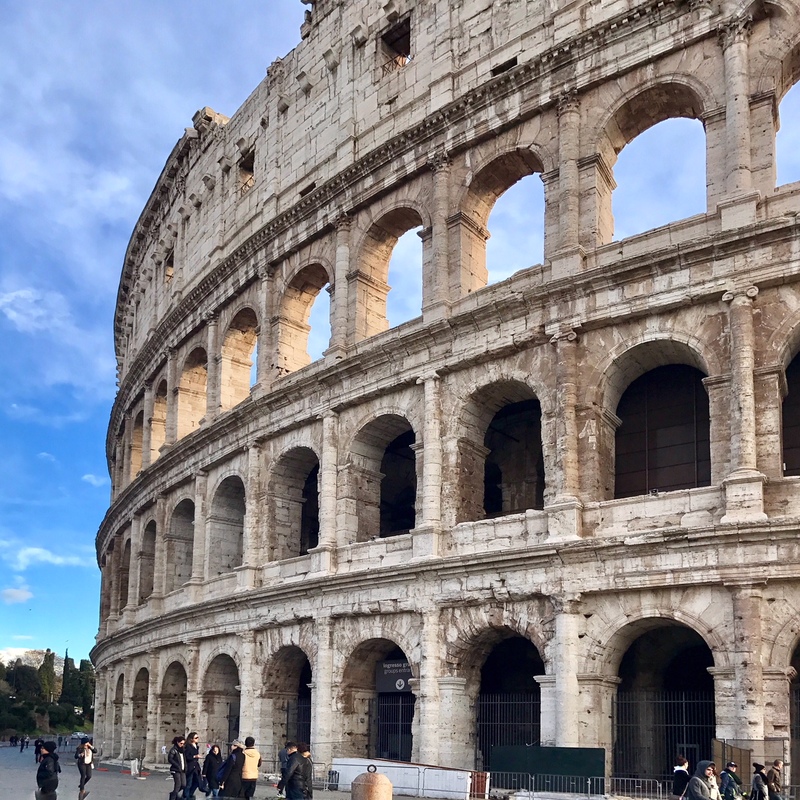 On Day 3 of our Rome in 3 Days itinerary, we can spend half or a whole day visiting the sites of Ancient Rome - Colosseum, Roman Forum and Palatine Hill. We'll get a relatively early start. This way, we have the second half of the day free. We may want to see some sites we missed the first day, get in some shopping, relax, or fit in one more site. Much of what we've seen already on our Rome in 3 Days itinerary has included "ancient Rome". The Pantheon, Piazza Navona, even the Vatican all have history and architecture going back to ancient Roman times. But on today's schedule, we are going to visit the sites commonly referred to as "Ancient Rome" - the Colosseum, Roman Forum and Palatine Hill. 1 - Coffee, What Else? By now, you know my drill. I love to start a day of sight-seeing with my Roman cappuccino and cornetto. Any bar will do. Maybe one by our hotel, or one we find along the way. Er Baretto is a sweet bar with outside tables, on via del Boschetto in Monti. A lovely spot for a morning coffee. Let's start day 3 of our Rome in 3 Days itinerary at Piazza Venezia. The most obvious thing to see here is this giant white "wedding cake" (that is one of several not-very-flattering nicknames the Romans have given it). The Complesso Vittoriano in Piazza Venezia, also known as "The Wedding Cake"
The building, Complesso Vittoriano, was built in the late 1890s and completed in 1925. 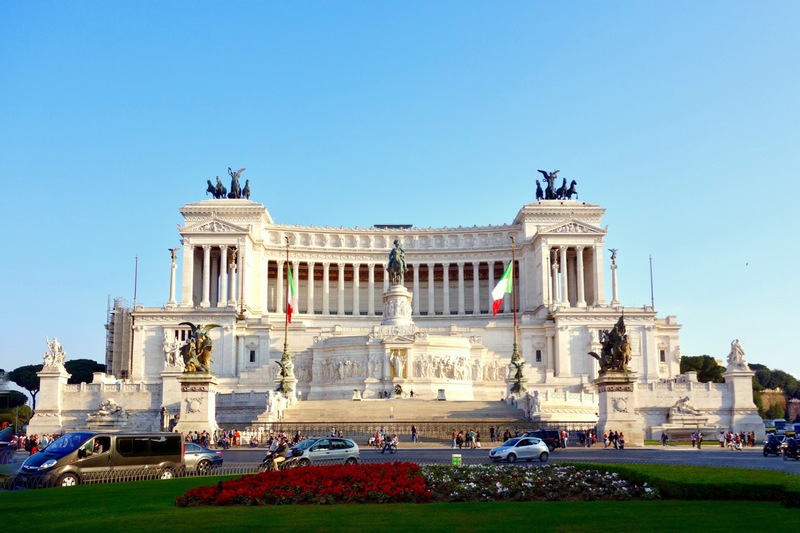 It was built as a tribute to Victor Emanuel II, the first king of a unified Italy. 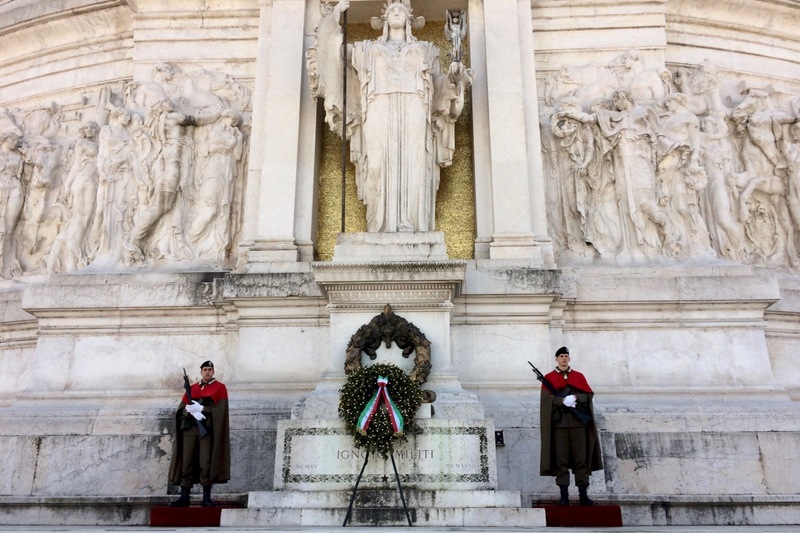 Although not fascist in style, the monument is often associated with Mussolini. 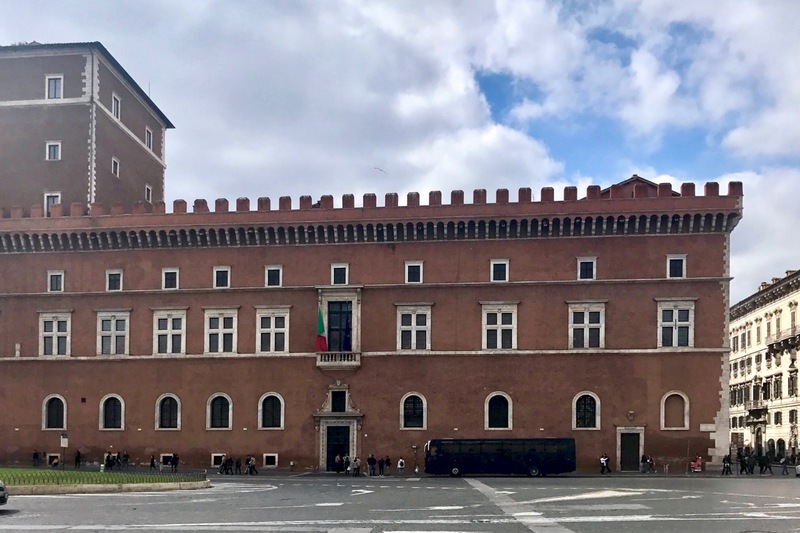 If you look up at the building on the right-hand side as you face the monument, you will see the balcony where Mussolini declared war in 1940. The big white monument is today known for housing the tomb of the unknown soldier (you can see two soldiers there, guarding two "eternal" flames, and you can go inside, for free, to visit the tomb). We'll head around the wedding cake, and walk up the ramp to Campidoglio, city hall (and where I got married)! The ramp to Campidoglio, or Capitoline Hill. Don't miss this for some of the best views of Ancient Rome! This is Capitoline Hill, where the Ancient Romans had their temple to Jupiter. Later, Michelangelo redesigned the square, as you see it today. The equestrian statue in the middle is of the emperor Marcus Aurelius. It's a copy. The original is inside the Capitoline Museums. The main reason I want to come here is for this view over Ancient Rome. From here we can see the Roman Forum, the Palatine Hill and in the back, the Colosseum. The perfect way to begin our visit to those sites. Visit the Capitoline Museums right here on Capitoline Hill. It will easily take 2 or more hours, so make sure you will have time and energy for this. We'll walk down the curving slope and end up on the via dei Fori Imperiali, or, the Street of the Imperial Forums. This is where some of Rome's emperors (and also Julius Caesar) built their government centers. The Roman Forum is where downtown city life was in Ancient Rome. It's off to the right as you walk down this road towards the Colosseum. You can go inside. An Imperial Forum was the forum that an emperor built, which is where he would conduct matters of state. On this road, you can see 4 fora (forums): On the right-hand side is the forum of Julius Caesar. On the left, in order coming from piazza Venezia, you have the forums of Trajan, Augustus, and Nerva. And of course, we are going to take a tour. There is way too much information and history to try to figure it out on our own. The inside of the Colosseum in Rome - it's fascinating, but why is so much of it missing? Partly from disuse (and earthquakes) over the centuries. But also because people used the marble to make other things, like the Vatican! I booked a small-group tour that will take us into the Colosseum and the Roman Forum. Romantic city break - If you can, visit the Colosseum towards closing time so you might catch a bit of sunset. Afterwards, hop over to the Hotel Forum for a romantic rooftop aperitivo. If it's winter and the rooftop is closed, go to nearby Propaganda or Enoteca Pentagrappolo, for a cozy drink. Travelling with small children - You may want to only visit the Colosseum and not the Forum and Palatine Hill. You may also opt to not go inside and simply walk around the Colosseum, the Arch of Constantine, and the via dei Fori Imperiali, taking it all in, without the stress and commitment of going inside these sites. None of these sites is very stroller-friendly. Turbo-sightseeing - For more to do in this area, visit the basilica of San Clemente, with it's two layers of underground excavations, going back to pre-Roman times. Or, visit another ancient Roman site in the area, such as Trajan's Market, or Palazzo Valentini. Or, try the Capitoline Museums. When you buy a ticket to the Colosseum, it includes entry to the Roman Forum/Palatine Hill. I put these two together because they constitute one archeological park. The main thing to know is you cannot leave the Forum/Palatine Hill and come back again. 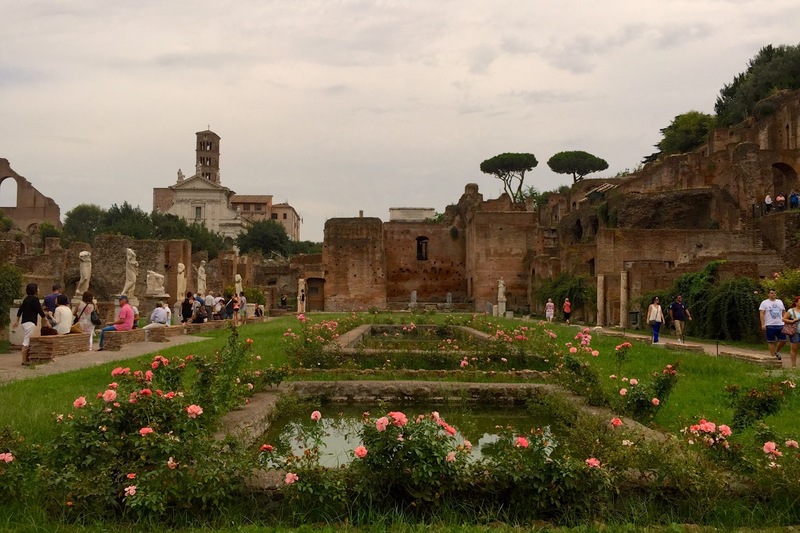 So if your tour or visit to the Colosseum ends in the Roman Forum, and you want to also see the Palatine Hill, either make sure your tour includes this part, or stay in the park until you've visited all you want to see. 7 - Lunch, and . . . There are lots of places to eat near the Colosseum. Or you can just grab a sandwich or slice of pizza. We have one more half day in Rome. What will we do? In this itinerary of Rome in 3 Days, I believe in leaving this last part un-planned. Perhaps just a meander back to your hotel, stopping for a drink along the way. Or maybe you want to shop. Perhaps go back to one of the sites you saw (or missed) one of the other days. Near the ruins of Ancient Rome, try Trajan's Market, another incredible set of ruins from Ancient Rome, and nearly always uncrowded. Or, visit the Capitoline Museums, or the Galleria Doria Pamphilj. If you want to make sure you have this second half day planned, I suggest trying to book in advance the Galleria Borghese. No, you can't actually see it "all" in Rome in 3 days. But you can see a lot. And that's a great start. Next time, you'll see more! In the map below, if you look at the very top, where the title is "The Best Itinerary for First Timers", you will see an icon with a little arrow. If you click that, a side-bar will appear. Then, you can select which day/which parts of the map you want to view.